For this very, very brief moment in time, the weather in Austin is perfect. Last week dumped buckets of needed rain on the city, leaving such swaths of pastoral verdure (not to be confused with its close friend manure) all around town that I fully expect to see a flock of sheep crossing Congress Avenue whenever I drive downtown. It's so lush and atypically green that I want to live outside all day long. And so the Hunny and I have worked in the yard, barbecued, dined al fresco on patios, and generally lounged like lizards in the sun. All this is well and good, but by the end of the week it's going to be in the mid 90's (yep, it's Texas) and the glory of air conditioning will be our only saving grace. 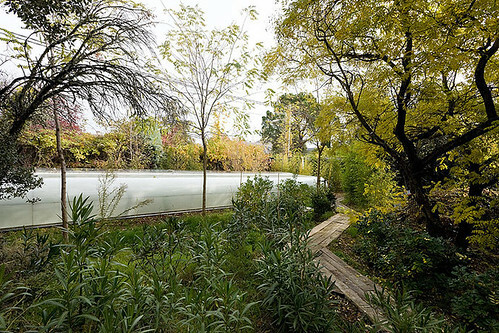 I think what I really need is a glass house so that I can enjoy the beauty of the great outdoors from the temperate, bug free comfort of the cushy indoors. I suppose this would do for a start. 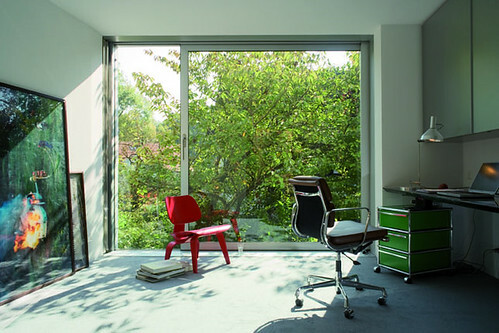 The Jodlowa House in Krakow, Poland, would suit my need for an interrupted view, plus it has a few added amenities that I think I could make quick use of. Honestly, I'm not sure how I have lived my entire life without an indoor pool. I have obviously been sorely deprived. It's ok to be naked in front of the tiny woodland creatures, right? I dream of having a house with neighbors so far away that curtains are totally superfluous. 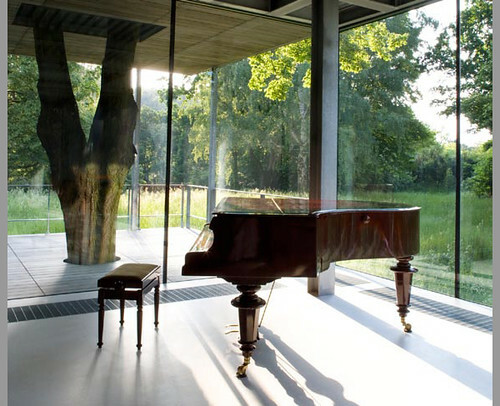 Also, I feel that if I had such an awesome view, my fingers would be magically inspired to bust out some Beethoven -- never mind that I am musically challenged. 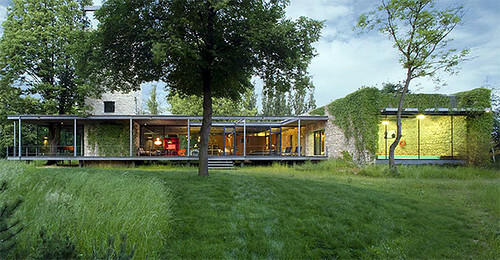 Still I personally like a little more pizazz in my pad, so I'm all about the L House designed by Philippe Stuebi. 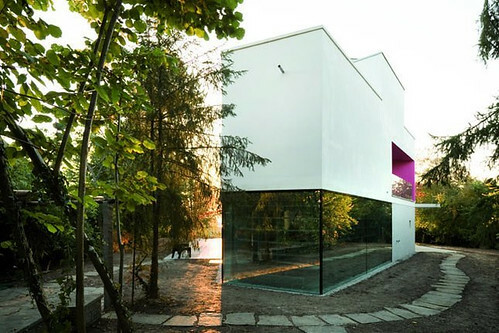 I'm not usually into big box houses -- generally preferring low, sprawling structures -- but this house has a seductive mix of light and color that makes me want to break in and lock out the owners. Shouldn't be that hard to get into a glass house, right? Hubba hubba, do you see what I see? 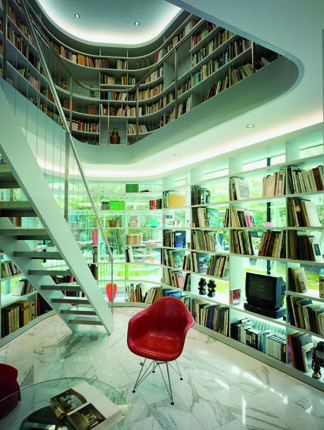 Yes, that is a glass walled LIBRARY, folks. 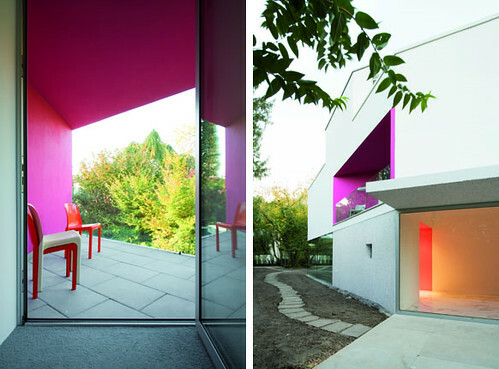 And I really don't have the guts to paint a room fuchsia, but it looks so fabulous in an architecturally appropriate setting. Perhaps the biggest hurdle keeping me from living the outdoor dream is my damn computer, which I am tethered to 24/7. 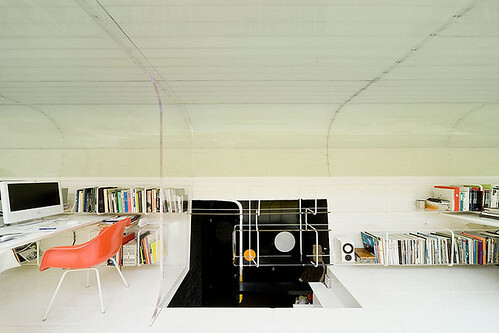 A glassy office would at least allow me to daydream about escape. 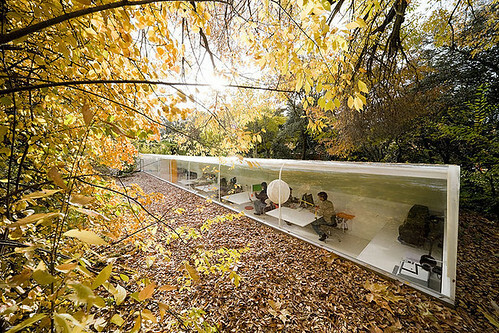 I think the most practical solution to that particular dilemma would be to construct a glass office in the woods like this one, designed by Iwan Baan. Don't these poor workers look like they are suffering terribly, what with the sunny yellow floors, mod furnishings and gorgeous views? Alright, maybe it's better that I don't work here, because I'm quite sure I would be too distracted by the beauty to get anything done. Luckily, there is an escape hatch for when the going gets tough. Wouldn't want anyone to feel cooped up, now would we? Since my yard is actually starting to look like this, I think I'm going to use my own escape hatch (ok, plain old door) and do some relaxing outside before the temperature becomes insanely unbearable and the mosquitoes carry me away. Ah, sweet, sweet nature.